The world was already screwed up; every country seemed to be fighting with its neighbor, unemployment was high and each political party blamed the other one for all problems. Food was getting harder to find and people were angry. 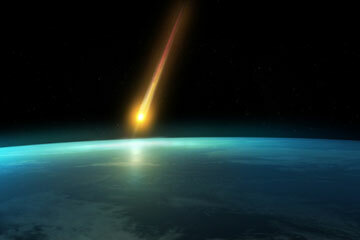 Then the asteroids came; hundreds of them hit the earth over a three day period. The fires and destruction on land was incredible, but the real problem was with the oceans. I guess the rocks from space were hot enough to vaporize a lot of water, so the level of the oceans went down. In many areas beachfront property was one half mile from the beach (I think that is funny in a sick way). All the changes to the oceans in a short period caused big underwater earthquakes, and volcanoes to erupt. The last time I saw a TV work was about a year ago, and the announcer said that almost 1/3rd of the earth was on fire because of the asteroids, and the temperature of the ocean was increasing too much. The whales died first, they couldn’t handle the sudden increase in temperature. In less than a month almost all the fish in the ocean died. The water was thick with death as the rotting carcasses were deposited on shore. The smell near the coast was horrible, and the flies were so thick that people could not even walk outside. I do not think anybody is still alive in Hawaii, or on any other island. Smoke is everywhere, although during the last month or so it seems to be getting better. I guess the forest fires eventually burned themselves out. I can’t see the blue in the sky anymore, or the stars at night. I can tell when it is daytime, because some light gets through so I can see, but I sure miss the glow of a hot summer sun and the beauty of the Milky Way on a clear night. The church people say it is The End of Time, just like the Bible says. I wish I would have read the Bible when I had the chance like my Mom told me to do. The scientists say that it is a natural event caused by identifiable forces, and can be rationally explained. The scientists hate when they cannot explain something. The haters (that is my name for them) say there is no God, or else He would save us, so we should all worship this government they set up. If you do not worship their government, they will kill you, which is why I call them the haters. I think they even have their own tattoo or something. But nobody can explain the dragons. One day out of nowhere flying dragons, the size of a 747, with a bunch of heads and tails (maybe 6 or 7) show up and start killing people. Their choices are not random either; they know who they want and where they are located. They hunt certain people and then just grab them with one of their big, ugly heads. People say the dragons never rest, never stop; they are always on the move in search of their prey. How did dragons get to California anyway? So, I sit alone here in my hideout in the mountains, hoping to make it through another day. Wondering how things could have changed so much in just a few years. I wonder if we did something that made this happen. Got to go now, I can hear the screeching of a dragon close by. Change will come every day; little things like a few less hairs on my head tomorrow and big things, like the death of a loved one. Change can be sly; it will sneak up on you in the darkness of night, or it can be bold – hitting you like a fist on your jaw in your doctor’s examination room. I accept that change is on the way, so I stay prepared for change by keeping my mind open, my heart willing, and my faith in God secure. Whatever the change may be, if God is bringing it then I am ready to accept it. Positive, negative, a catastrophic end of life, or a promotion at work: change is at the door and often it is God who is knocking. I have no idea when the end of time will come; next week or in 10,000 years. It is not something that I think about very often. But I believe it will happen one day, and if I am alive when God reclaims the earth, unlike Dave, I will not be confused as to what is happening. I will know. I am ready. This entry was posted in Living a Christian Life, Where Are You Going Today and tagged Armageddon, destruction, end, God, good, great, Jesus, peace, perspective, plan, Salvation, time, trust, Wisdom by Michael Obermire. Bookmark the permalink.